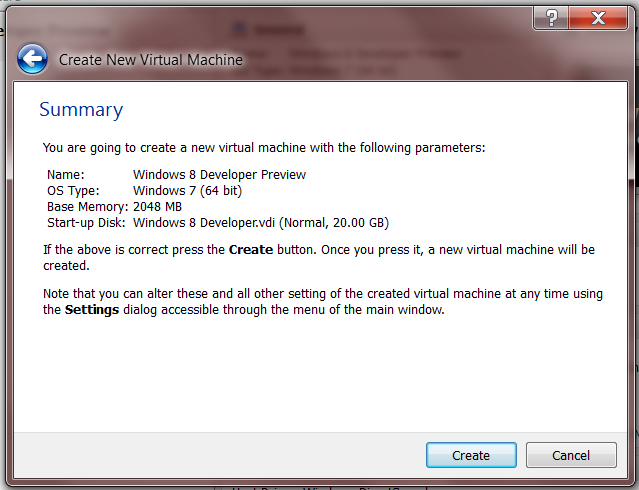 Since installing the Microsoft Windows 8 Developer Preview on a VirtualBox VM yesterday, a few constituents have asked me to detail the process of creating the virtual machine in VirtualBox and installing Windows 8. 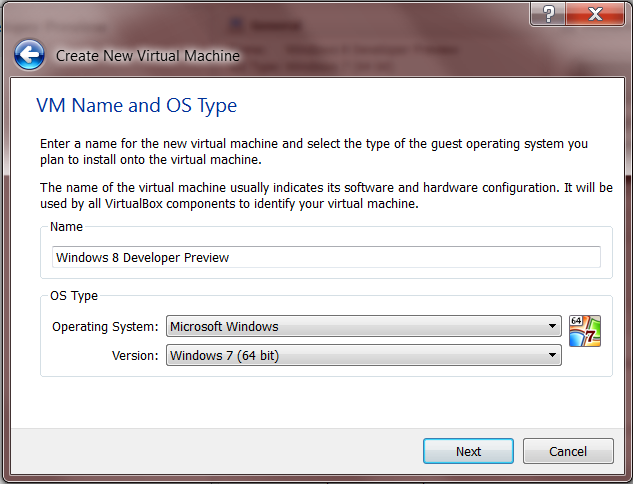 Below is a quick and dirty walk-through demonstrating how to install Windows 8 on a VirtualBox virtual machine. 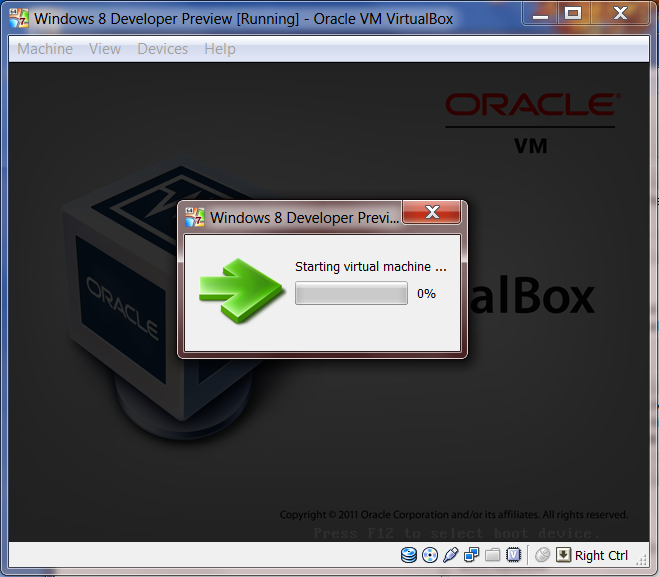 Before you start, you will need to download and install Oracle’s VirtualBox virtualization software. 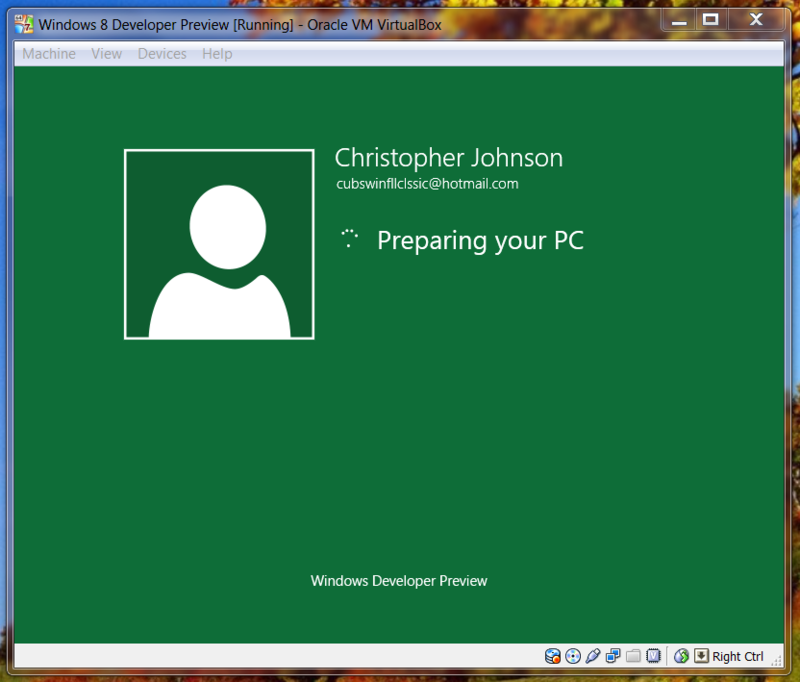 You’ll also need the Windows 8 Developer Preview installation media. Finally, make sure that your hardware supports virtualization and that it has enough juice, RAM and hard drive space to run a Windows installation on top of your host operating system. I’m running this on a Core i7 1.73GHz laptop with 6 cores and 8GB of RAM. 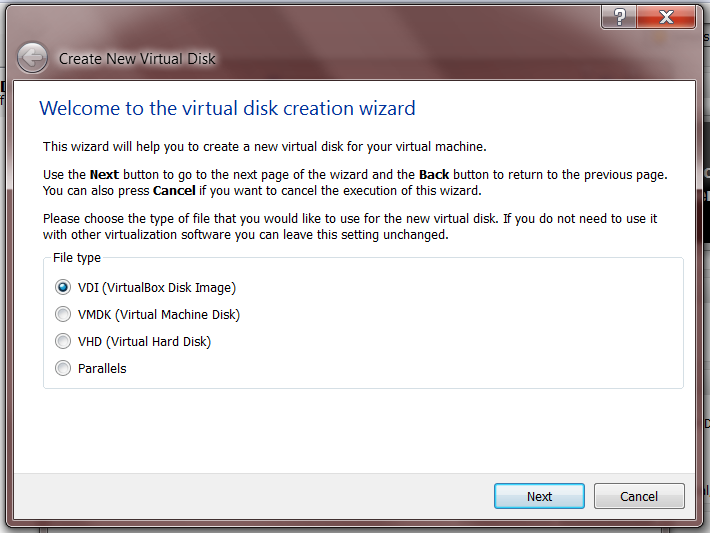 Once VirtualBox is installed, create a new VM by clicking the ‘New’ button. Call the VM anything you want (I went the creative route), and select “Microsoft Windows” and “Windows 7 (64-bit)” as the Operating System and Version. 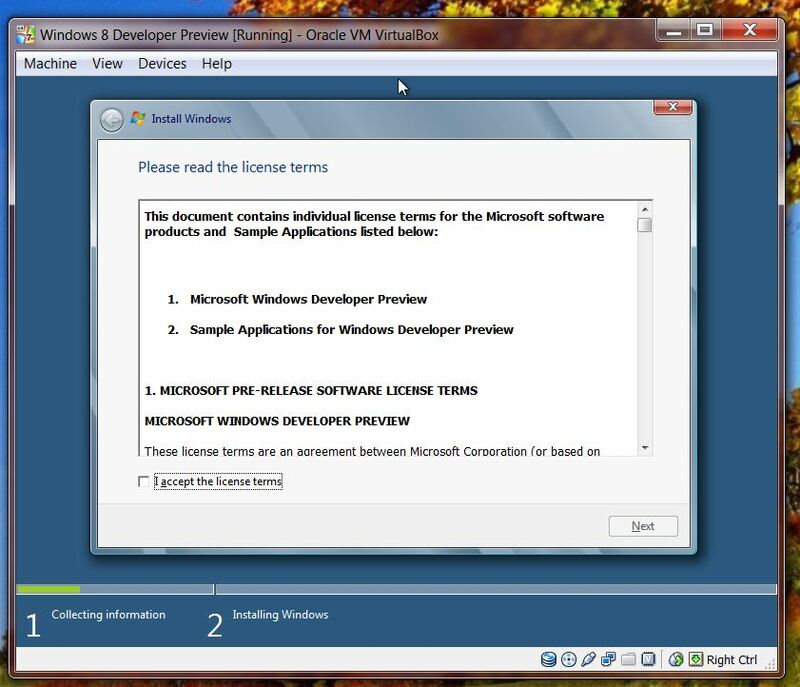 Don't worry, the similarities between Windows 7 and Windows 8 virtually end here. 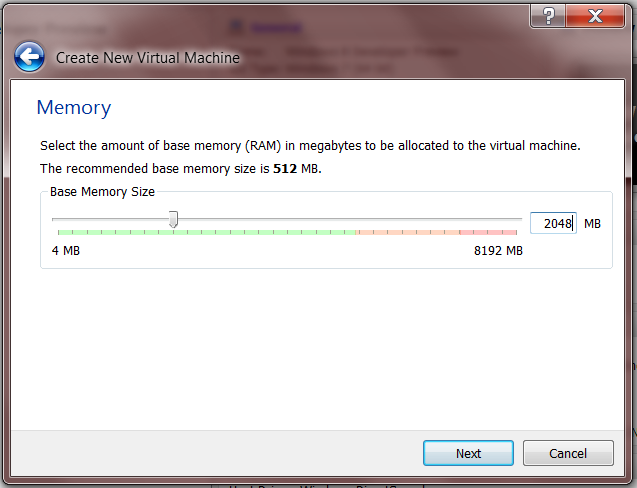 Give the VM plenty of memory; Windows 8 requires at least 1GB, but I recommend at using at least 2GB. Make sure your host system can handle it, though, because this memory is automatically allocated up-front as soon as you boot the VM. Give 'er at least 2GB of RAM. 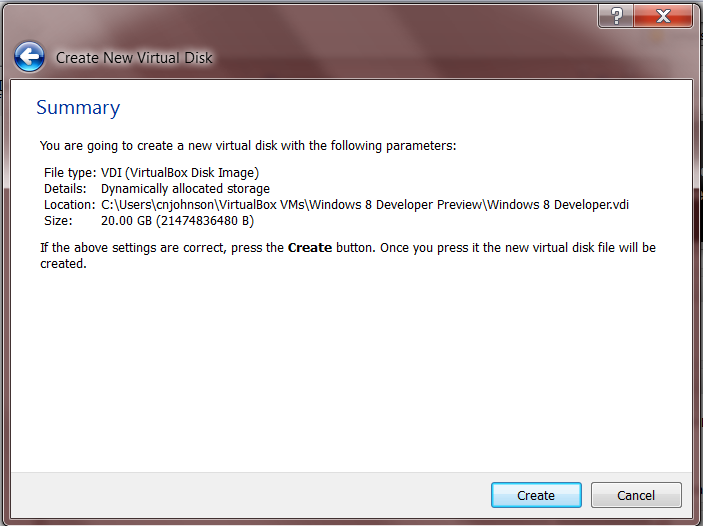 You need to give the VM a virtual disk from which to boot. 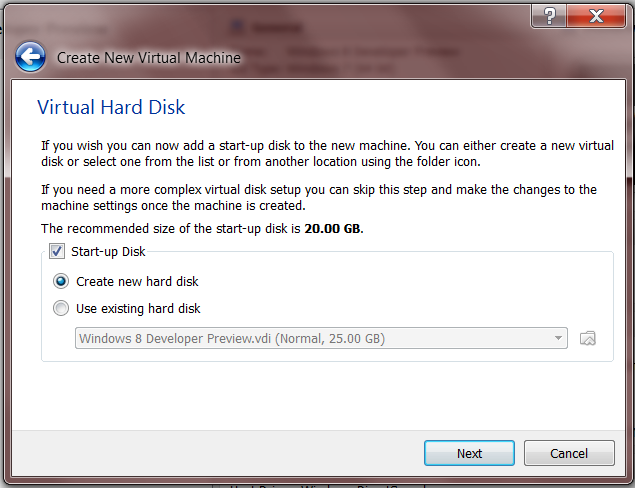 Select “Start-up Disk” and then select “Create new hard disk” unless you want to use an existing disk. 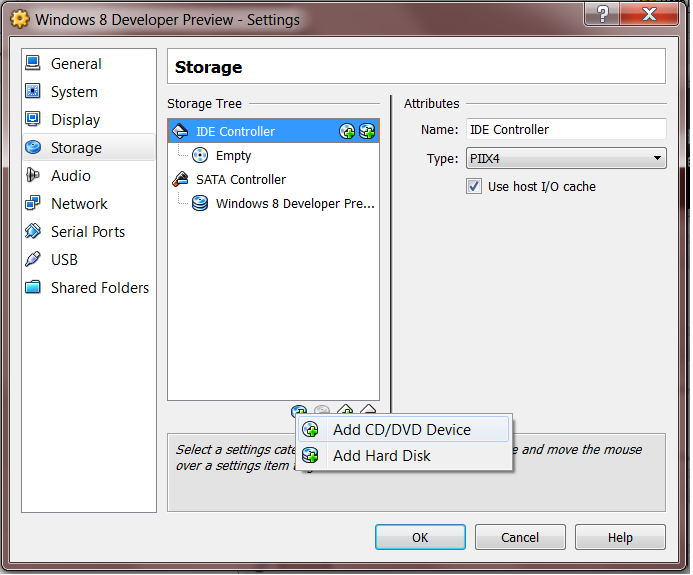 The next options allow you to create a disk image that can be imported to various other VM players. 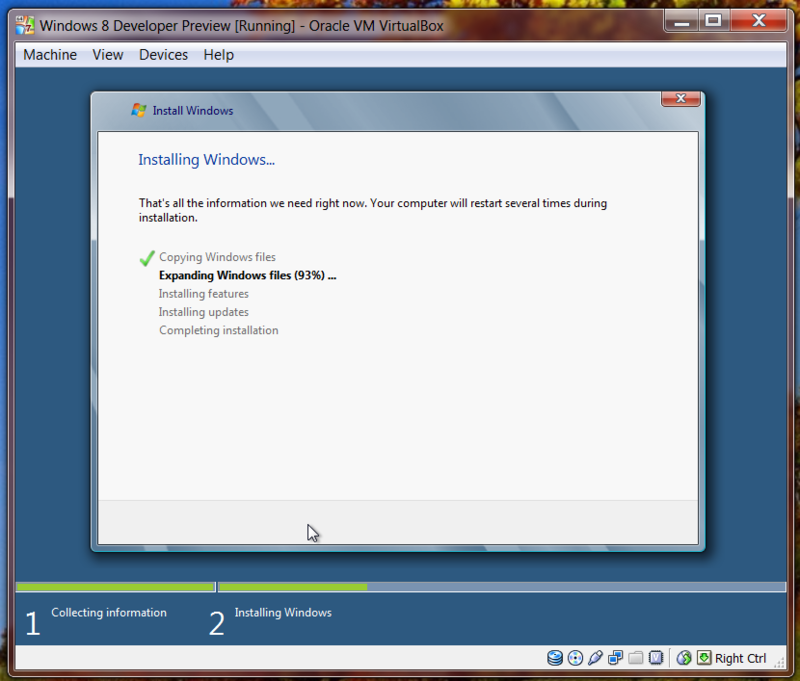 I chose VDI because at the moment, VMWare Player won’t support Windows 8 anyway. 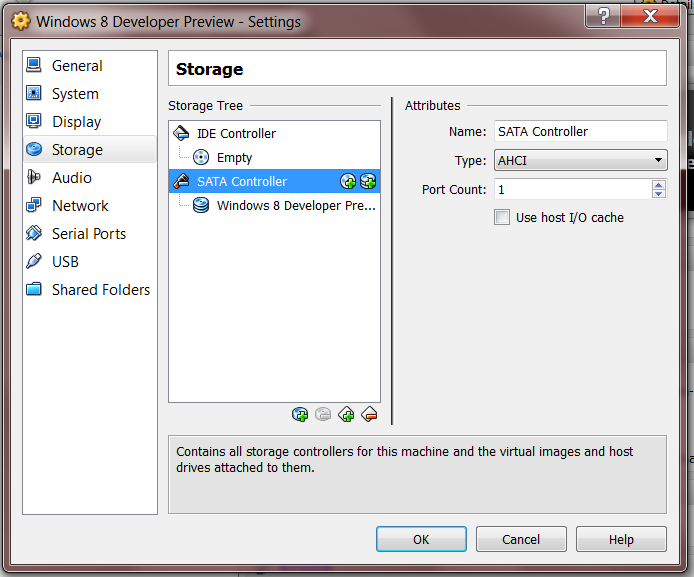 Next, specify how VirtualBox will allocate your virtual disk space on your physical hard drive. 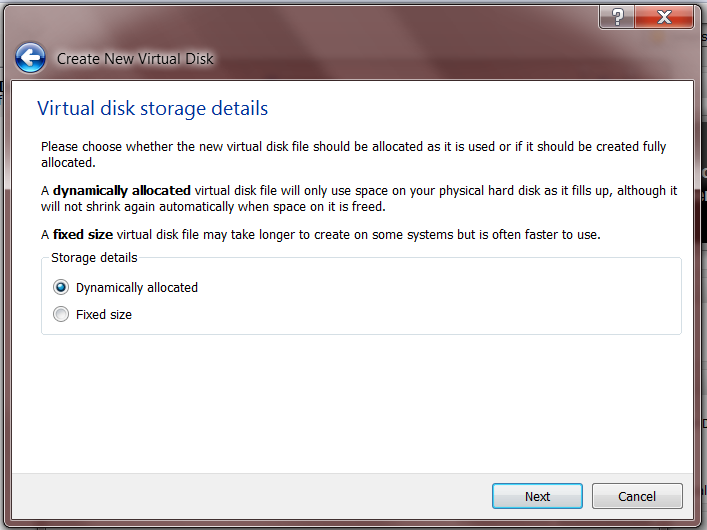 If you don’t want to allocate all of the disk space up front, choose “Dynamic” and the disk will be expanded as needed. "Dynamically allocated" is faster, too. 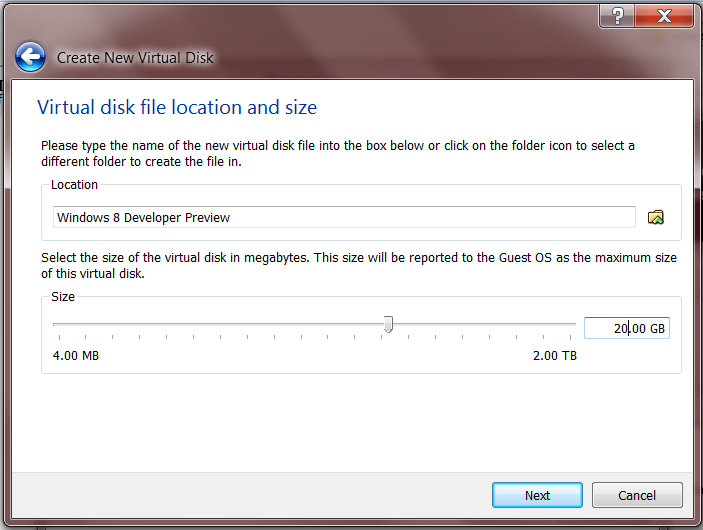 Specify how big the disk should be. I wouldn’t use less than 20GB. Or you can put it on your internal 2TB laptop hard drive. You can't go back now. There's no "Back" button. Note that you can alter these settings later (you will). Now that you’ve created your machine, you need to configure it to properly run Windows 8. 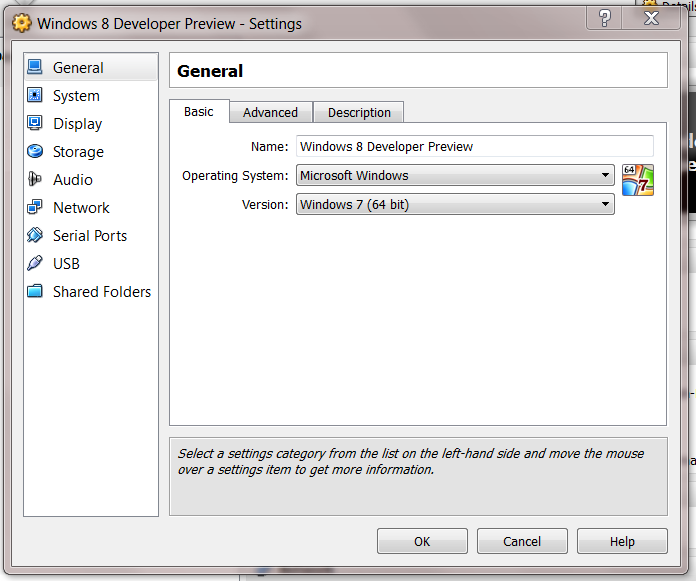 You’ll have to specify display settings, processor cores, and mount the Windows 8 Developer Preview installation ISO. The first tab of the “General” screen allows you to change the name of your machine if you’re feeling flip-floppy. How about the Fighting Mongooses? That's a good team name: the Fighting Mongooses! 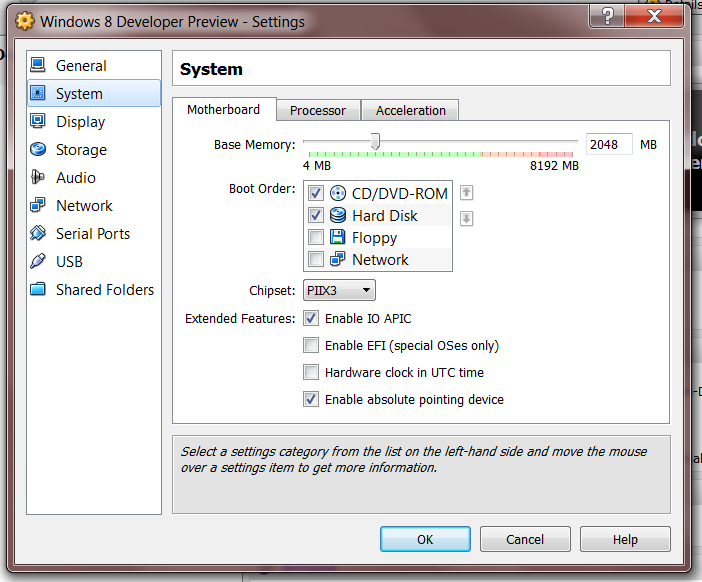 The “System” screen allows you to set the RAM allocation, processor cores, and virtual device boot order. 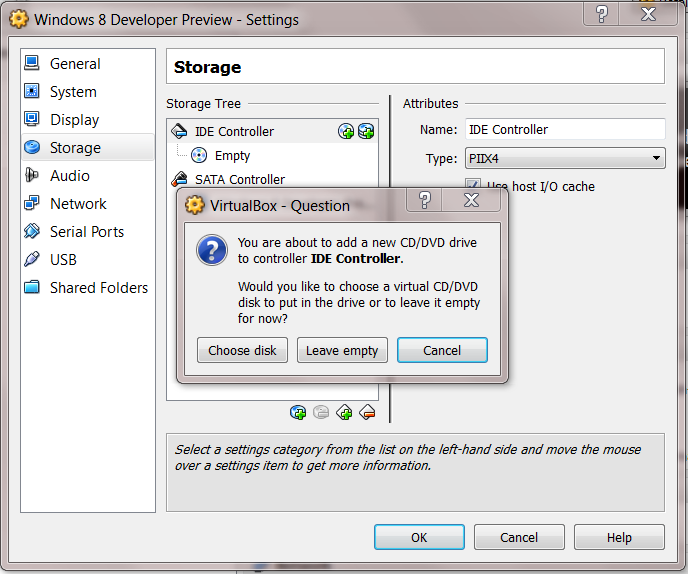 Make sure that your CD/DVD-ROM virtual drive is set to boot first. If you don’t have one, we’ll get to that soon. See that "IO APIC" checkbox? That's what VirtualBox has and VMWare Player doesn't, and it's required to boot Windows 8. 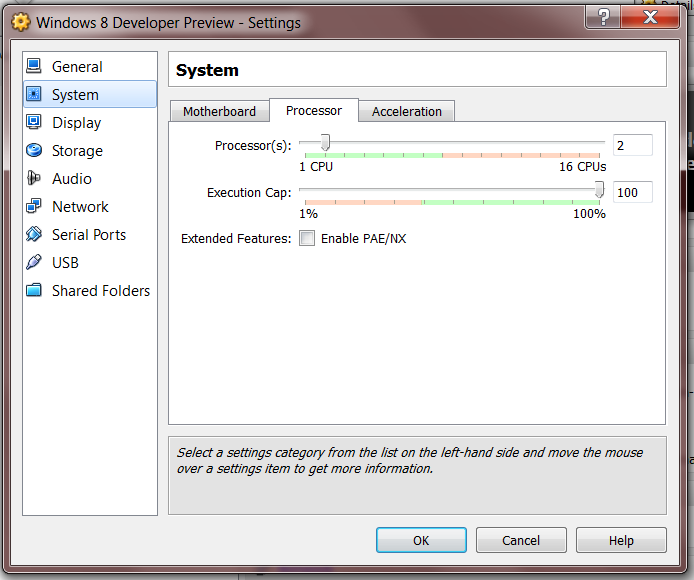 Click the “Processor” tab of the “System” screen to set the number of processor cores that your VM can use. I’d give it a minimum of 2. Don't give your virtual processor more cores than your real processor has to lend. 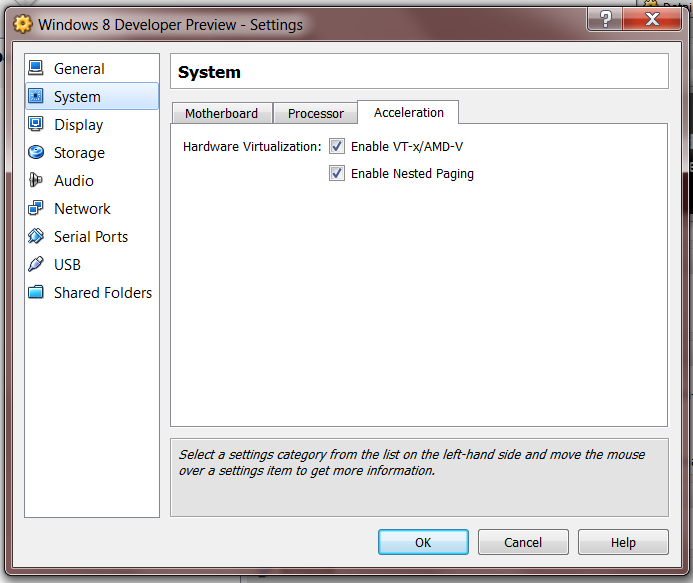 Enable hardware acceleration/virtualization on the “Acceleration” tab. I'm not entirely clear on what these checkboxes enable. You will also need to ramp up your video memory in order to use Windows Aero. 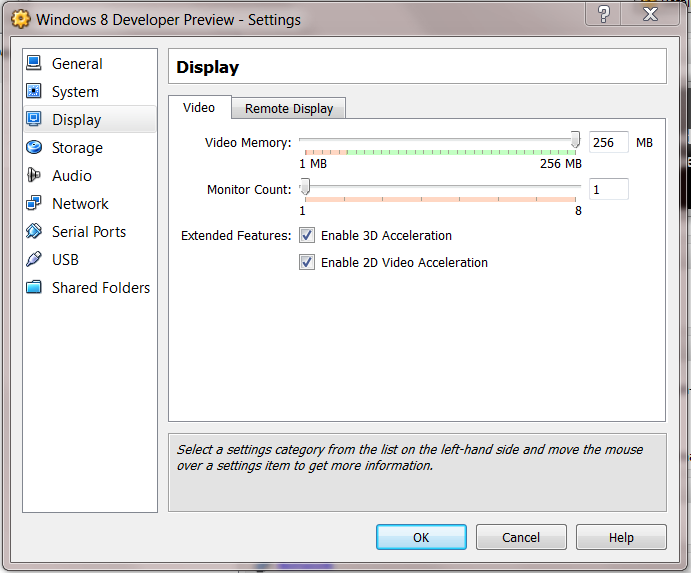 Give your VM at least 128MB of video memory, and enable both 2D and 3D acceleration. I'm not sure why you would want to virtualize an IDE controller. You don't need another hard disk. You can un-mount this later. 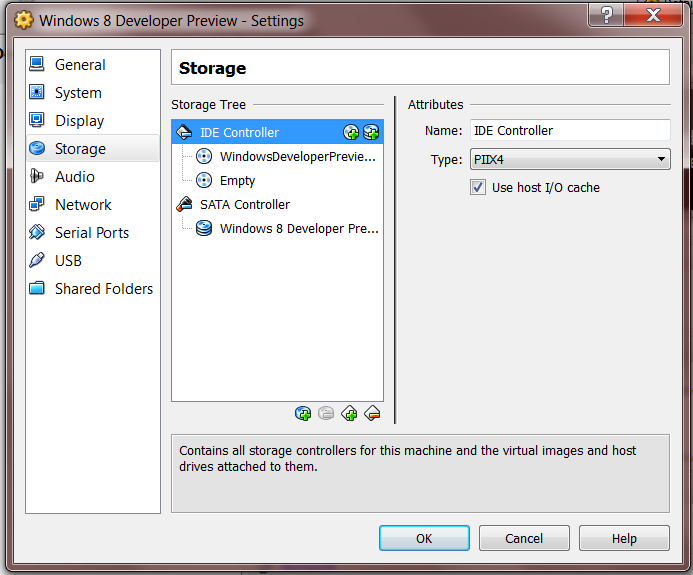 You should now see the WindowsDeveloperPreview ISO mounted on your IDE or SATA Controller. If you already have an "Empty" controller, there's no need to create another one. I just added it for the sake of explaining how to do it. Behind the dialog box, you can see the prompt to "Press F12 to select boot device" in the lower right-hand corner. It actually installed much faster than Windows 7 did, but this isn't a complete version. Finally, after a couple of reboots, Windows 8 will boot for the first time. You will be asked to supply a Windows ID. I don’t know what happens if you *don’t* supply one, but do you really want to find out? Not sure how I feel about linking to a Windows ID off-the-bat. Probably about the same way I feel about OS X asking me for my Apple ID post-installation. Happy Windows 8-ing! Just remember that this is a developer preview– not even an alpha or a beta– so expect things to be buggy, sluggish, incomplete and strange. I’ll post a review later on my impressions so far. nobody else recognise such precise about my trouble. You are amazing! 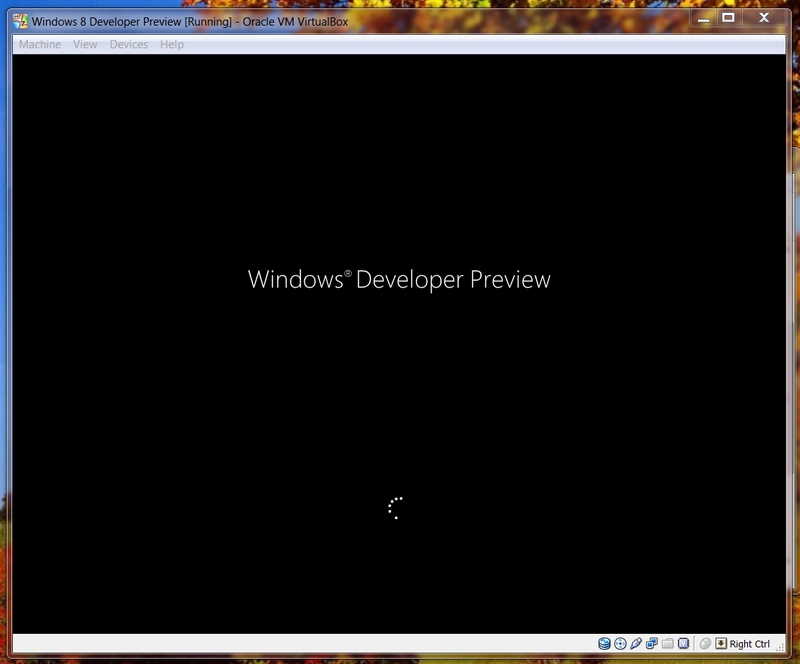 up here Installing Windows 8 Developer Preview on a virtual machine using VirtualBox | The DotNETter. And I actually do have 2 questions for you if it’s allright. Is it just me or does it appear like a few of these comments appear like they are left by brain dead people? 😛 And, if you are posting at additional social sites, I would like to follow anything fresh you have to post. Would you list of all of all your community sites like your twitter feed, Facebook page or linkedin profile?